At This Material Culture we’re all about ideas, the bangle, necklace, earrings you buy weren’t churned out in a factory. Each piece has a story, a concept, and about 4 other earlier versions I decided weren’t good enough. I wanted to share the stories behind some of our pieces with you because we’re not a faceless company, we are two quirky, creative people with a passion for creating products that mean something (and are really pretty). I don’t know about you, but I love dangly earrings. I have two holes in my lobes so I love wearing a cute pair of studs and a fab pair of statement earrings. I’ve bought and made a tonne of earrings in the past and I’m always drawn towards feathers. I wanted to make a really beautiful pair of statement earrings that featured these gorgeous silver feather charms but on their own I think they’re a bit short. I decided to incorporate a little bit of beading because let’s face it, I really love beads! I love the idea of dreamcatchers and I looked at Native American jewellery for inspiration for these earrings. Turquoise features heavily as you’d imagine and I decided some beautiful genuine turquoise beads were exactly what they needed. Turquoise has been used in amulets and jewellery for thousands of years, by many cultures, from the Egyptians, to the Aztecs, to the Native Americans. It has always been associated with protection and it really is a beautiful, natural stone, one of my favourites. I think turquoise beads were enough colour so I framed them with delicate black seed beads and some gorgeous silver glass beads so the turquoise really stands out. 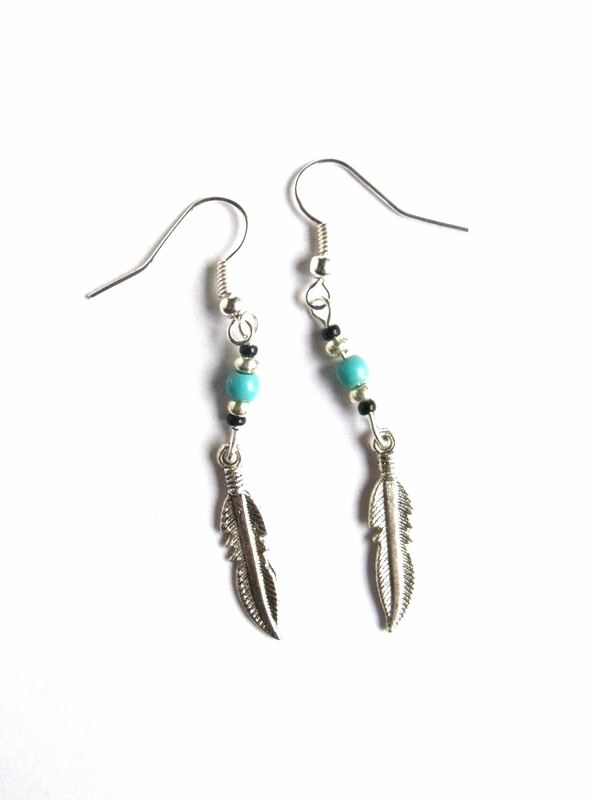 So, add some turquoise beaded headpins to beautiful silver feather charms, on silver plated earrings wires and we have these stunning dreamcatcher earrings. I really love these, I’ve made a pair for myself. I’ve worn them with a simple white shift dress, which looked fab and I’m a big fan of patterned maxi dresses and these go perfectly! If you’re looking for a laid back, boho summer look, the dreamcatcher earrings are perfect. Thanks for reading, hope you like the earrings, let us know if you get a pair and how you style them! This entry was posted in The Story Behind. Bookmark the permalink.